Home›Competitions & other fun stuff›Write a Monologue or Duologue for us for a chance to win great prizes! We had so much fun in Waiting for Callback and Take Two writing the script scenes - talking squirrels, dystopian melodrama, voices from beyond the grave, teenage pregnancy – we gave it all a go. Now it’s your turn. We want you to write a short monologue or duologue and enter it into our competition for the chance to win great prizes! Shortlisted entrants get their work read by our editor at Simon & Schuster or the editor of First News! And there are books and vouchers as prizes and First News are going to report the competition! There’s more detail in the Rules below . We’ve put some suggestions and links below and check out Honor's videos packed with tips on creating characters and writing monologues and duologues on her You Tube channel, but what we care most about is that you bring your character or characters to life so that we can ‘see and hear’ them when we read your words. We want you to have fun. You might never have tried writing a scene in a play or TV or film (or maybe you already have a couple of screenplays under your belt!) but please don’t be put off by any of the terminology or get too worried about format. You’ve probably read plays at school (and did you read J.K. Rowling’s The Cursed Child?) Have you been to the theatre? Do you like going to the cinema? Enjoy watching films or TV? You’ve been picking up writing tips without knowing it. If you choose to write a monologue then you will just have one character (actor) speaking from start to finish. If you choose to write a duologue then you’ll have two characters (actors) speaking. You’re in control, you’re the writer and the director, you get to make up your character or characters (there are no limits – a teenager? A President? A… pigeon? ), you imagine their personality and their motivation and their quirks. You know that they have something to tell us and you choose where and when (any place, any period – maybe something you’ve studied in history will start you off). The subject can be anything that makes you excited - funny, sad, dark, bizarre - funny and sad and dark and bizarre? And even though we want the pieces to be vivid and powerful that doesn’t mean they have to be melodramatic. Quiet can be powerful too. You choose. Think about what you like about your favourite film and TV scenes. Think about what you don’t like (what bores you?). What about reality TV? What scenes seem genuinely ‘real’? Have a look at the resources on the brilliant BBC Writers Room website. They have guidance on format and sample scripts from well-known series from The Musketeers to Danger Mouse for you to check out. And there's really clear help on the BBC schools website too. Jan (17) and Straker (15) crouching in a clearing, afraid, hunted, half starved. Think about any plays you’ve seen or read. Think about the passages when a single actor has been under the spotlight and how powerful that can be. There are collections of monologues available that you could search down in the library for inspiration. If it’s your thing, you could go full Shakespeare on us and write the whole thing in iambic pentameter (you probably won’t but check out some of the Shakespeare monologues being performed by fab actors in this Shakespeare Solos series here). Elektra is a teenage actor-in-training. She’s just got home from an audition. It went badly. She’s alone in her bedroom. We have poster packs for your library or classroom, just email us if you'd like us to send one out or download from here: .Monologue and duologue tips; Collaborative writing. We are so excited to read your entries! The competition opens on 20th January 2017 and entries must be submitted by email (see below) by midnight on 30th April 2017. There are two age groups: 10-13 and 14-16 (go by your age on the day that you send in the entry by email). Schools that submit entries for their pupils will be entered in a draw for the chance to win a bundle of Simon & Schuster titles for their school library. The winners will be chosen from a shortlist of five in each age group by our guest judges: in the age group 10-13 by the editor of First News and in the age group 14-16 by the Editorial Director at Simon & Schuster, Jane Griffiths! The duologue should be no longer than 450 words (again inclusive). Feel free to make your entry shorter – even much shorter - if you’d like to. We’re not going to be ruling out entries because of things like spelling mistakes – just do your very best. Have a look at how speeches are laid out in plays or scripts and try and follow these because they make what your characters are doing and saying nice and clear but don’t be put off or intimidated by formatting. If you have any questions and you can’t find a friendly teacher or librarian to help out you can always email us through the website. You or your school or writing or drama group on your behalf need to submit your entry to us by email as a Word document headed Monologue/Duologue Competition through the website address taketwocomp@gmail.com. Double spacing would be lovely! If you can't get something typed up then you can scan it or send us a photo! Each entry should specify name and age at the date of submission and the entrant’s (or entrants) name(s) should be on every page. In each age category there will be one outright winner (individual or shared between collaborators). 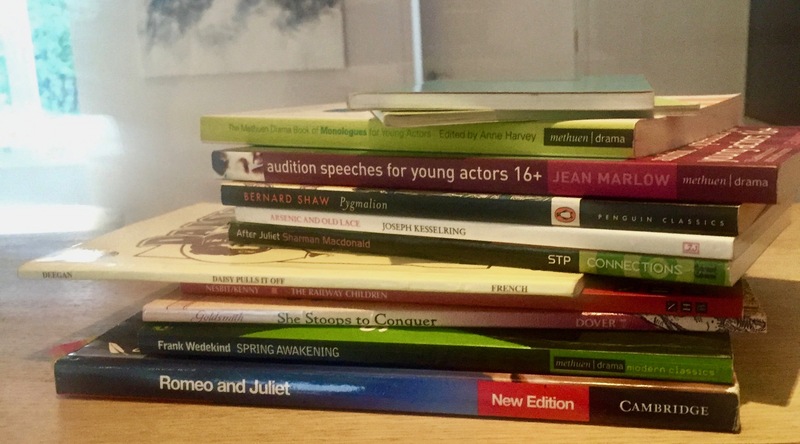 The winner(s) will receive a £50 voucher for books, theatre or cinema at their election as well as a bundle of six books that they can choose from a list of recent Simon & Schuster titles and signed copies (or, in this case as many copies as there are collaborators!) of Waiting for Callback and Take Two. The winning entries will be announced in First News! All schools or writing groups or drama groups that submit entries on behalf of their students will be put in a ‘lucky dip’. 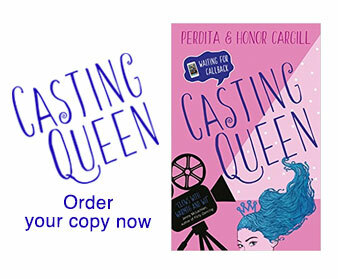 The first school drawn randomly will receive a bundle of ten Simon & Schuster children/teen titles for their library as well as signed copies of Waiting for Callback and Take Two.